I recently engaged in an email discussian with George Mattson, creator of the Syntar. 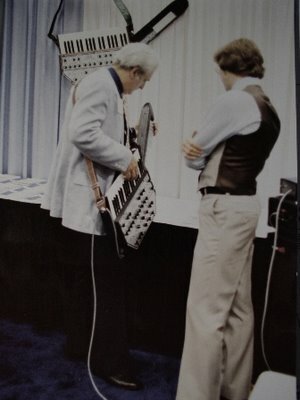 That's him next to Bob Moog who's trying out his Syntar at the 1980 Chicago Summer NAMM Show. The discussion we had was fascinating and private, and I thank him for sharing his story with me. As it was part of synth history I asked George if it would be ok to put up a post here, as I'm sure other synth enthusiasts would enjoy this bit of synth history as well. He gave me the go ahead, so here it is. Note that this was originally private and not meant to be a post - this was just me and George going back and forth. The references to Starship are to Jefferson Starship. Many thanks to George for taking the time to share this with me, and for letting me put this up. "I was born as a non-Mormon in Salt Lake City, Moved to Anchorage, Alaska in Sept '64 3 weeks before my 10th birthday. Graduated from High School there in 1973. That Fall I moved to Moscow, Idaho where I enrolled in the School of Mines studying Mining and Metallurgy. Bought my first synths at that time-the 101 and 200 when there were only 3 manufacturers. ARP, Moog and EML. I liked the versatility of the EML line and went that route. That was the days that you had to send a certified cashiers check for the full purchase amount and they were made to order. Went to College 5 semesters and stayed a freshman with a 1.18 GPA. My older brother moved down and had a bunch of recording gear so we started a recording studio trying to break into commercials. I had picked up a Poly-box by then and my Yamaha YC-45D. Then bought the EML sequencer and a 300. Couldn't stand the clutter and built the box for the sequencer, Told EML what I was doing. They bought the original cases back from me and credited that against another 416 panel and another 300 just to fill 2 big gaping holes in the box. I had most of the synth panels on one side of my bedroom and all of the keyboards (including a Baldwin upright, a Rhodes and a friends EML 500) including the 101 keyboard on the other side of the room. We'd hire musicians to play the tunes and I ran/programmed the synths. Oct. 04 1978 I was alone in the room running back and forth between the consoles and the keyboards when I said to myself: "what I need is...." and the concept of the Syntar hit me. Then I said "somebody should make one of these" Then I said: "Hey, I could do this!" (I talked to myself a lot.) Jan '79 I moved to Bend, OR. Moved in with my folks and tried to find investors. I built a hand-made prototype using EML circuit modules and went to the 1979 Atlanta NAMM lugging this thing around trying to get a manufacturer to go for it and hire me as a team leader on the project. The only person that had any emotion about it while talking to me was Herb Deutsch from Norlin. He said he'd talk to his Board of Directors and call me. In Jan '80 I went to the NAMM winter market in Anaheim with Michael Garrison (He landed his distribution agreement with Ariola on the way down) and Mike asked if I saw the Moog booth. He took me over and we saw the prototype of the Liberation strapped onto a mannequin. I went home devastated and my folks put up the investment money to get started. They're no slouches; both my Mom and step Dad have electronics degrees. I advertised the Syntar in the mags a month before Moog advertised the Liberation. The thought was if I could beat them to it, at least people couldn't say I copied them. That never worked. They had a little bigger budget than I did. But, anybody researching it will find that I had it first. No big deal now. I had to close shop because we were broke and were facing a takeover. So, I closed it down, called Starship, told them I needed a job and got hired. A year and a half later They wanted me to move to San Francisco rather than flying me back and forth from home. I didn't want my 4.5 and 3 year olds growing up in the California rock and roll scene and moved here in July of 1983. Went out one more time with Starship in Aug/Sept 1983 and told them I was leaving. Been here since doing different things." "Well, that's the way it went down. Can't change the facts. Of course, I would loved to have made money from all of the work I put into it. The sad part is that I still can't play keyboards. I'm a guitar player since I was 10. Hey, right after I moved to Anchorage." "That picture was taken in June of 1980 at the Chicago NAMM. That's me next to him- I was 26 YO. Notice that he's playing prototype #3. ( The first was the one I hand built from EML circuit modules, the second used forked plasic keys over fluted shafts-that one was later modified and used as a LASER controller by the guy doing the LASER shows for Blue Oyster Cult and Tangerine Dream)) The Syntar hanging in the background is just a panel and cardboard simulated left hand keys. The prototype Bob is playing has curved aluminum keys that dragged a resined string over a pulley. The final (and production)version was much more aesthetic and worked like a charm." BTW, George also provided the EML Poly-Box Samples in this post. Hello my name is Jarrod and I was looking over your site and I think it is great. If you are trying to find more ways to get more traffic on your site and be part of my new community and go to Traffic Helper or post your page for free at Our Post , both of these pages are for people like us, it is made by, and made for the people that dont have big compines and are first starting out. Umm...thanks for the spam, Jarrod. Spring loaded potentiometers? That's certainly unique, cool idea. I knew there was a synth-tar before the liberation, but I didn't know it was smited (smaught?) so. There's a quite a few instances of spring-loaded potentiometers in synths. Oberheim pitch/mod paddles for example. My point was that there are like 7 or eight in a row on the Syntar, all accessible to the left hand in a very ergonomic way! Actually, There are nine. All continuous transfering linear to rotary motion using fish hooks, hat pins, tie wrap ends and hobby springs. So, as you push a key, it turns a pot. simple, but being able to use one finger to turn 1 pot...and most people have more than one finger. The control available were: Pitch down, Pitch up and pitch mod-from LFO (all 3 were full travel adjustable with trim pots-so you could set your pitch bends to a third, fifth, octave..whatever). Then Filter sweep down, up and mod from LFO. Sustain (applied voltage to the VCA to control the volume with a variable key-so when the envelopes died out, this key over-rode them.) Amplitude mod-applied LFO to VCA and Noise-injected the noise source into the mix stream pre-filter. The remaining controls were switches for glide up, down and a selection between linear and logarithmic modes. Choices, choices. Only your imagination was the limit.